It's cold here and for the first time this year I felt I had goosebumps and had to wear vests and scarfs to keep me warm. Autumn is coming, although I love summer, I kind of like autums as you can snug up the sofa with a hot cup of coco and cover yourself with a soft blanket, reading your favorite decorating magazines. It made me realize, when I get back home I have to re-organize my closet, all the summer clothes and shoes have to be stored. Did you do yours already? How cool is this frame or mirror that hangs onto the large mirror? 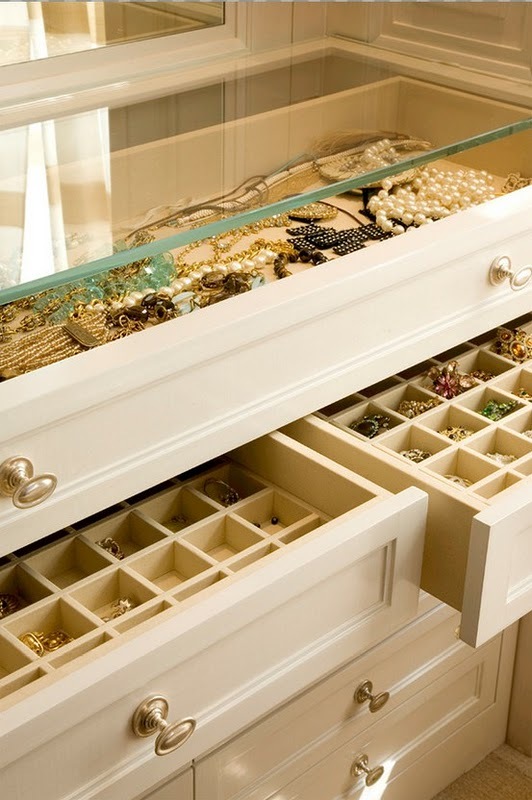 Love the drawers + jewelry too! Yup its that time again, gotta put all the summer clothes away...its a nice change though. Mirror layering?! love THAT idea! Hey gurl my husband said your package was being held for signature. I sent you an email a while back but hadn't heard from you. Hope all is well. We are designing our walk in robe at the moment - these shots are great inspiration. Thank you! I totally need to clean out my closet and make it perty. This is good inspiration. I do think that while others are so good with organization, several are so bad at it. I for one am having issues with my own closet. I just cannot seem to put things in order. These ideas you have shared are a must-try. I hope that these will work out for me. Thank you for posting. Where did you get the tiny boxes to separate the jewelry?